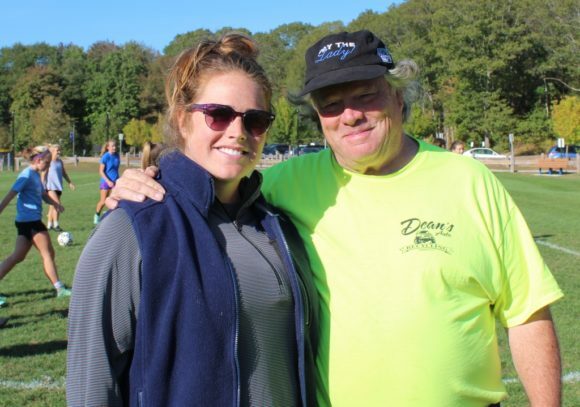 Lyme-Old Lyme High School Girls’ Varsity Soccer Coach Paul Gleason takes time out from a recent practice to pose for a photo with one of his assistant coaches (who is also his daughter), Allyson Gleason. Paul Gleason’s Old Lyme soccer girls soccer are having quite a week! Not only did they top this week’s Connecticut Girls Soccer Coaches Association Class M-S poll, but they also continued their remarkable unbeaten run reaching 12-0-0 overall and 8-0-0 in the Shoreline Conference. Old Lyme defeated Coginchaug Friday at Lyme-Old Lyme High School 6-0. Mya Johnson put the ball in the net three times while Maddie Ouellette scored two goals and Ciara Klimaszewski claimed one. Danielle McCarthy notched the single assist for the Wildcats. Emily Rivera and Emma McCulloch shared the Old Lyme goal with six saves in total. In goal for Coginchaug was Claire DeFlora with 12 saves. Old Lyme is now 12-0-0 overall and 8-0-0 in the Shoreline. Previously on Wednesday, Old Lyme defeated Haddam-Killingworth (HK) 8-0 at HK. Mya Johnson scored three goals and gave two assists, Maddie Ouellette put away two goals and also had an assist, while Brittney DeRoehn, Maria Denya and Lydia Tinnerello each had a goal. Danielle McCarthy added an assist. Emily Rivera and Emma McCulloch were in the goal for Old Lyme with a total of nine saves. In goal for HK were Gabby Wyzykowski and Mia Rubino with a total of 10 saves. This afternoon, Oct. 16, the girls face Old Saybrook away. Wow!!!! You girls are AMAZING! You make Old Lyme very Proud!